festive | I Get Dressed In The Morning! I Get Dressed In The Morning! Here’s my selection of items to inject cute into the festive party season!! Click the pictures to view the items on Etsy! Become a fully fledged member of the Disney Club! I discovered Devowevo a while ago, but back then I think they had a different name. They do all kinds of adorable dresses with ponies, owls, rainbows and all sorts on them! This dress with Minnie’s grinning face is perfect for a night out! I would wear it with nice thick black tights and maybe some crazy sculptural heels like these. For all you pastel lovers out there! (me!) I’ve found this amazing crochet hairbow complete with sugary sweet inspired heart decorations! It’s from a seller I have just discovered, Sugar Junkie Shop, and their name doesn’t disappoint . If you want all things candified you’ll want to check them out! I would wear this with a pastel dress and white tights! Okay, I’m obsessed with tights… just think of all the possibilities! Like these wonderful pastel rainbow tights by Virivee. Hand dyed and 50 Dernier means they are truly unique and will last for a fair while. These would be perfect for anyone keen to pop a little bit of subtle cute into an outfit. Why not whip out a cute black dress and doll it up with these? How about this one?! Boys need some ‘cute’ too this Christmas! Who said that lovely things were just for girls? Any fun loving fella would appreciate this sweet sweater from Rogue Retro! On the other hand, any gorgeous girly could wear this too in a casual big-n-baggy sort of way with leggings and heels for cosy drinks with friends. Everyone needs a Christmas jumper so why not make it a wonderfully adorable one?! I would wear this with a big red bow, like this one! Since Christmas is going to be upon us sooner than we think, I’m going to focus today’s Etsy Cute around incorporating kawaii into other peoples Christmas gifts! Because cute is meant to be shared! You can’t really justify spending a fortune on kids until they are old enough to appreciate it properly/ not grow out of everything within a week! So baby gifts have to have longevity and take them through to toddlerhood or be very reasonably priced if they will only be used for a few months. Oh, and if you’re me… they have to be CUTE! Is there ANYTHING cuter than baby dino feet? These awesome knitted booties are perfect for any little monster at Christmas! Adorable and toasty warm! They are available from the wonderful ‘Lemonade and Magnolia‘ run by Kylie Mustapic. I have been lucky enough to see more of Kylie’s work than is available on her Etsy as she is a Leeds based children’s wear designer. She does craft fairs and maintains a sale space in Bird’s Yard in Leeds. This talented miss also creates hairclips, homewares and grown-up’s accessories! It could be fairly difficult to explain the concept of Kawaii to granny.. so why not just show her by giving her an awesome handmade gift this Christmas? 50’s Chic for Grandma on Christmas Day! Now, I am well aware that not all Grandmas enjoy baking, cooking, knitting and coffee mornings, but this is MY Etsy Cute post and I am imagining MY Grandma. She very much loves all of the aforementioned things. Last Christmas I made my Grandma a half apron, as she wears one most of the time around the house. If I was short on time however, I would have bought a handmade apron instead and supported a small business. Let’s just stop to admire this one from ‘Boojiboo‘ shall we? There are many, many, many apron sellers on Etsy.. And since my favourite (Dot’s Diner) have ceased trading, Boojiboo have quickly taken the ‘adorable apron’ space in my heart. JUST LOOK AT IT!! It brings a chic 50’s skirt vibe to Grannies look whilst still being super practical AND adorable! It’s subtle enough to be classy and still fun. A+ for Boojiboo I think! Incorporating cute and still keeping it mysterious as to who have supplied said gift to the bulging pile at the Christmas do may be pretty hard but oh well, everyone figures out who got who anyway! 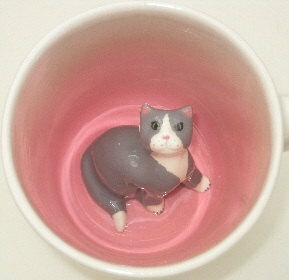 Guys, thats a cat hiding in a mug.. I obviously don’t know what your budget is… at my work, it’s ridiculously low….this makes for funny gifts from the pound shop and some great giggles. If you work in a more conservative office environment, or take your Secret Santa more seriously then these mugs by Spademan Pottery are so perfect! They do SO MANY different ones and finding out someones favourite animal isn’t hard at all! You can order these mugs plain on the outside so the little critter is a true surprise, or have the animal paw prints on the outside, if you know your colleague wants to show off their adoration! The items from Spademan Pottery are such good value for money.. remember.. you are buying HANDMADE! for under £20! Honestly, you really should know what to buy your best friend.. but okaaaaayy, i’ll do some of the work for you! Chances are if YOU like cute things, your best friend does too.. so you can go all out on the sugar sweet factor here! Pens at the ready! Make your best friend your PENPAL! cute factor? 100! Me and my best friend write letters to each other! She lives in a different city, talking and texting is fine, but just seeing her handwriting, drawings and little posted gifts makes me do a little cry from pure joy! You should try it with your bestie even if you live next door to each other! People often forget there are some amazing sellers on Etsy who specialise in expertly picked vintage items, and not just handmade. I am a lover of all things vintage.. my favourite eras being the 50’s and 60’s (and some cute 70’s too!). ‘Tinsel and Trinkets‘ sell paper ephemera, plastic trinkets and retro holiday decorations. My favourite item in their store is this pack of wonderful letter writing paper! Obviously giving writing paper means you may eventually receive it yourself with a lovingly written message on it! But I would encourage my bestie to use these in her scrapbook and enjoy them every day! Just the four for today! I tried to pick gift idea for people who aren’t ‘mum, dad, brother, sister’ etc. Something a bit different! Hope you enjoy browsing Etsy!